Gov. Jindal at a press conference Wednesday afternoon at the Port of New Orleans Administration Building, joined by ISH President Erik Johnsen (left of Gov. 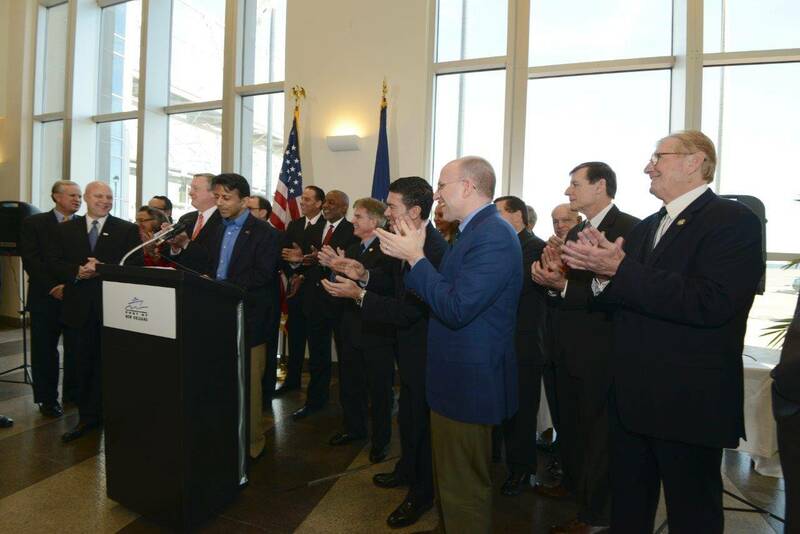 Jindal) New Orleans Mayor Mitch Landrieu (to the left of Johnsen), Port of New Orleans President and CEO Gary LaGrange (far right), Louisiana Secretary of Economic Development Stephen Moret (to the left of LaGrange) and a host of local and state elected officials. Louisiana Governor Bobby Jindal and International Shipholding Corp. President Erik L. Johnsen announced the company will relocate its corporate headquarters from Mobile, Ala., to New Orleans, where the business was founded in 1947. Listed on the New York Stock Exchange as ISH, the company owns and operates a global fleet of waterborne cargo vessels. ISH recorded annual revenue of more than $310 million in its just concluded 2013 fiscal year. After Hurricane Katrina, recovery challenges led the company to relocate its corporate headquarters to Mobile. In New Orleans, ISH will create 100 new direct jobs at a 45,000- to 50,000-square-foot headquarters facility in the city’s Warehouse District, where the company will soon complete a purchase of property already under contract. The new direct jobs will average $70,000 per year, plus benefits, and LED estimates the project will result in an additional 113 new indirect jobs, for a total of more than 210 new jobs in the greater New Orleans area. In addition to operating a diversified fleet of 50 cargo vessels, International Shipholding provides brokerage, logistics and other maritime services for a broad array of customers, including the U.S. Department of Defense, the U.S. Department of Agriculture, International Paper, Norfolk Southern, Freeport Copper & Gold, Dow, Cargill, CSX, The Mosaic Company and more. ites; and the headquarters retention and engineering center expansion of Pelican Engineering Consultants, with 195 new direct jobs in St. Tammany Parish. Other noteworthy New Orleans area project wins include Lockheed Martin’s 166-job, liquefied natural gas cryogenic tank expansion at the Michoud Assembly Facility; MECO Inc.’s corporate office and water treatment equipment facility that will yield 127 new direct jobs in St. Tammany Parish; and a $40 million expansion by New Orleans Cold Storage with 125 new direct jobs at the Port of New Orleans. LED began discussions with ISH about its potential corporate headquarters relocation in March 2011. To secure the project, the State of Louisiana offered the company a competitive incentive package that includes performance-based grants of $5.17 million to offset costs of establishing the new headquarters facility in New Orleans and $5.10 million to reimburse relocation costs associated with the company’s move. In addition, ISH will receive the comprehensive workforce solutions of LED FastStart®, the nation’s No. 1-ranked state workforce training program. Based upon ISH’s plans to renovate a historic structure, the company could be eligible for a Restoration Tax Abatement incentive waiving property taxes on improvements to the structure for up to 10 years, subject to approvals from the local governing authority and the State of Louisiana. International Shipholding Corp. will conduct its headquarters facility renovation in 2014 and 2015 and relocate employees and resources as the corporate headquarters is completed. The entire transition will be concluded by the fourth quarter of 2015, when ISH will begin formal operation of its headquarters in New Orleans.